The agricultural industry is growing to meet demand, and in order to keep up with that demand, talented employees are needed. Wouldn’t it be nice to have a sufficient number of resumes of only qualified candidates to fill your next role? Unfortunately for most, this just doesn’t happen. 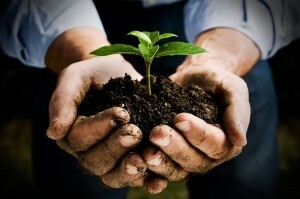 More than 60% of agribusinesses expect up to 10% of their staff to retire in the next two years. When AgCareers.com surveyed students, only 12% reported that their peers in other degree programs outside of agriculture see the industry in the same positive light that ag students do. When you consider the number of youth entering the overall workforce compared to those expected to exit, there is a large gap and the competition for talent is becoming fiercer than ever. Overcoming this gap and increasing the pipeline begins with branding your organization. Employer branding, like product branding, is about perception and in this case about the employee experience at your organization. Reputation means a great deal to candidates. When asked specifically about company brand/image, nearly 80% of job seekers indicated that the company brand/image was important or very important in selecting which jobs to apply for. Many people associate employer branding with expense. There are tactics involving some expense, and often there is people resource/time, but employer branding does not have to be costly. For example, develop a standard follow-up procedure for applicants that apply to your job openings. The number one complaint AgCareers.com hears from job seekers is that they don’t hear from the employer after submitting their application. At the very least, set-up an automated response to let candidates know you have received their resume and when you expect to get back in touch with them or fill the position. Depending on the size of your operation, other actions can be taken to impact employer brand, like a website that has a clear career section or a description that allows potential applicants to know how to apply to positions. There are also advertisements and career fairs. The key is to make sure your organization is getting the most out of these avenues. For example, does the job description convey the employment brand with a brief description about the organization? Are you sending the right person to represent your business at career fairs – someone who can really sell the organization? There are also logistical aspects to consider when focusing on attracting talent. As you develop job descriptions for the roles for which you’re recruiting, involve the manager/supervisor. Seek input on actual job functions and try to articulate the role and responsibilities as closely as possible. Limit the qualifications to those that are required or preferred. It is easier to be broad in this area and screen for the ‘would like to haves’ after you’ve seen all of the applicants. Include a specific location when possible, as well as a salary range. If the salary range is negotiable, that is acceptable to include. Be sure the description is current and legitimate if you reuse a job description. 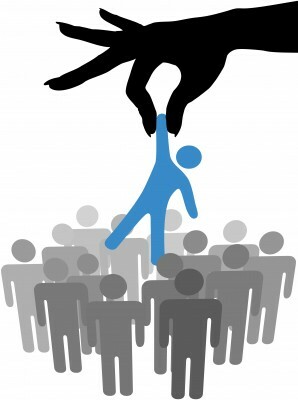 As often as possible, forecast your recruitment needs, and consider several options for reaching potential applicants. Word-of-mouth and networking remain the most effective means of sourcing talent within the industry, but casting a wider net through online job board advertising and corporate websites. A long-term strategy could include reaching out to those who might influence career decisions, such as high school teachers and counselors as well as university and community college faculty. This entry was posted in Recruitment Strategy, Specific Positions on July 28, 2015 by ZFR. It’s taking companies longer than at any time in the last 15 years — maybe even longer than ever — to fill a job, and that languor is losing them candidates. Two recent reports on hiring put the average time from vacancy to offer at more than four weeks. And both studies — one from Glassdoor and the other from career site publisher DHI Group — say the time to fill is getting longer. In the midst of a national recovery that has seen the unemployment rate go from a high of 10.1% to 5.3% in June, while the labor force continues to contract, Glassdoor found hiring time went from 12.6 days in 2010 to 22.9 days at the end of 2014. Even when the data is scrubbed to control for changes in hiring location, industry mix, and other variables, Glassdoor found that interview time increased between three and four days. The monthly DHI-DFH National Mean Vacancy Duration says it took an average of 28 working days (which includes Saturdays) to fill a job in May. In just one year, the average increased by 3.3 days. In some industries the average is even higher. 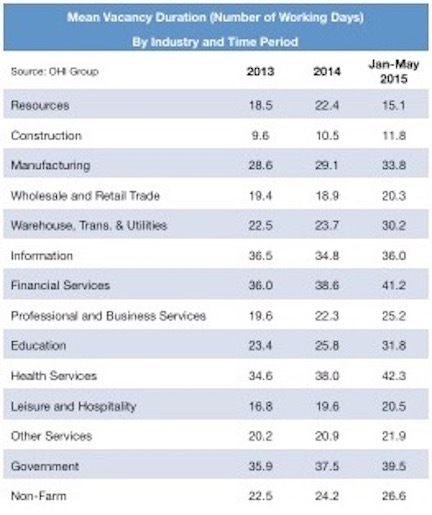 For health services jobs the average is 42.3 days; financial services jobs average 41.2 days. Recruiters at one of the largest search agency networks in the world say this hiring slowness is costing employers candidates. It’s a candidate-driven market, say 9-out-of-10 recruiters, yet too many employers drag their heels on hiring or make low ball offers. 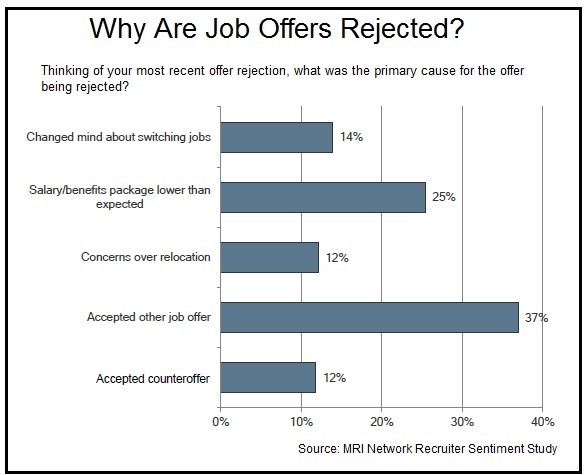 The survey of the independent recruiters at MRI Network agencies says the leading reason why a job offer is turned down is because the candidate accepted another one. That’s not, however, what the recruiters see happening. Almost half of them (47%) say the biggest obstacle to hiring is salaries that are too low. When they find out during the interview, they simply withdraw. Glassdoor’s analysis didn’t delve into job offers or rejection. Instead, it looked at 344,250 job interview reviews posted on the site between February 1, 2009 to January 31, 2015 to examine hiring time in the U.S. and five other countries. 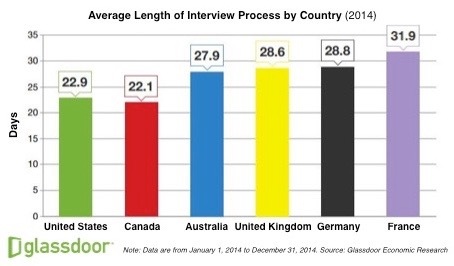 “Our findings suggest the job interview process has indeed grown significantly longer in recent years, both in the U.S. and around the world,” the report concludes. 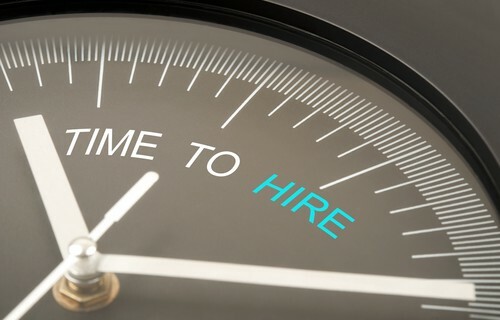 Some causes of the longer hiring times are beyond the control of either job seeker or employer. For example, hiring is faster in Miami (18.6 days) than it is in Seattle (25 days). And smaller companies take less time to make a hiring decision than do larger ones. “Telephone interviews add 6.8 to 8.2 days; group panel interviews add 5.6 to 6.8 days; one-on-one interviews add 4.1 to 5.3 days; background checks add 3.1 to 3.4 days; and so on. In every case, additional layers of candidate screening add to hiring times,” according to the report. This entry was posted in Passive Recruiting, Recruiting Trends on July 23, 2015 by ZFR. Findings from an independent survey of more than 840 senior HR leaders from across the globe reveal that over a half (53%) believe that there is a shortage of talent quality, with 84% admitting that it is harder than ever before to attract and retain talent. The survey commissioned by Lumesse, a global leader in talent solutions, and undertaken by research specialists, Loudhouse, highlights that over three quarters (76%) of respondents agreed that a shortage of talent will be the biggest threat to their business in the next two years. Furthermore, specific industry sectors that demand highly skilled employees, such as the pharmaceutical and financial industry, feel the shortage in talent most intensely. These three challenges represent a 360° spectrum of needs, internally and externally, domestically and internationally. The research also found that HR leaders are pessimistic about identifying and hiring the right skills in the future with (68%) agreeing they are experiencing a lack of visibility into what these needs will be in 12 months’ time. This entry was posted in Recruiting Trends, Recruitment Strategy on July 21, 2015 by ZFR. Some recruiters call it ‘social media profiling’. Others call it ‘social screening.’ In certain cases, a more appropriate term would be ‘stalking’. Want to know some alarming statistics? According to a study by social media monitoring service Reppler, over 90% of recruiters visit a candidate’s profile on a social network as part of the screening process. A further 69% have rejected a candidate based purely on their social media content. Those figures paint an almost Orwellian picture, with candidates across the globe being scrutinized based on statuses, snapshots and associations. We live in a world where everything you post online – whether that be an angry rant about pet peeves or a picture of a pet pooch – can be (and often is) found online by recruiters and hiring managers. And that’s an eerie thought. To clarify before continuing, using LinkedIn to check out a candidate’s professional credentials is perfectly fine – it’s more or less what LinkedIn was built for. Candidates have created those LinkedIn accounts to see and be seen. It’s their platform to showcase their skills and experience, and they’ve put their profile together in full knowledge that it will be assessed by recruiters during the hiring process. Nope…LinkedIn isn’t the problem. Nor are social accounts which are clearly and unmistakably connected to the candidate’s professional career. Many people working in digital marketing jobs, for example, create specific work Twitter accounts and blogs to advance their careers. You’ll also have candidates in developer jobs who have created their own websites to showcase their range of technical skills. These professional channels are all A-okay to investigate. Nobody’s privacy is being invaded, nothing questionable is going on and nobody is acting in an unethical way. It’s when recruiters are thirty clicks deep into a candidate’s holiday photos that social media screening becomes an issue. They’re looking, and they’re looking further than you might think. Recent research from Jobvite has found that recruiters don’t just stop at LinkedIn. 66% screen via Facebook, 52% via Twitter, 21% via Google+, 20% via RSS and 15% via Youtube. With platforms such as Instagram, Whatsapp and Snapchat also increasingly being used for recruitment purposes, this list will only continue to expand. 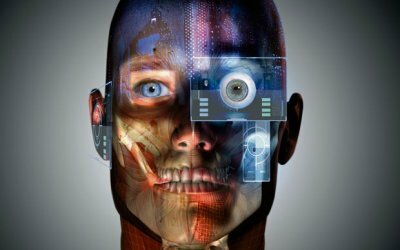 Like it or not, we’re all being watched and assessed online as part of the standard recruitment process. So, where should the line be drawn? There definitely comes a point where social screening oversteps the mark. With social media profiling statistics on the rise, it’s high time to face the unpleasant reality of screening evolving into stalking. There’s a huge and identifiable difference between a personal social account and a professional one. Looking at the latter is valuable, as well as being fully anticipated. Dissecting the former is akin to eavesdropping on a candidate’s conversation with their close friends or observing their behavior on a night out. It’s not relevant to the role in question and it’s also creepy. Yes, creepy. Recruiters don’t need to be thumbing through a candidate’s Instagram account to assess whether their skills are a strong fit for the job, nor do they need to see their mundane social updates on the night’s TV to gauge their cultural fit. Those posts weren’t created for your eyes and they aren’t applicable to the candidate’s application. Does anybody else have the screeching violin music from the Psycho shower scene playing in their head right now? Now, it’s understandable why checking out personal social accounts is tempting. Professional accounts are highly selective in the information they share, and you don’t exactly get a sense of whether your candidates are racist Neo-Nazis or sadistic sociopaths from their LinkedIn profiles. Plus, it’s not likely that a candidate is just going to come out and tell you that they swear like a sailor and have daily inclinations to rant about the world and all of its inhabitants. But you can’t poke and pry into their personal lives. Why? Well, firstly, we all have a right to privacy. Things that candidates post on their non-professional social channels were intended for their friends and family – they don’t pertain to things that you have any right to research. So what if the candidate has ten cats as their cover picture? And what’s it got to do with potential employers if they wrote an embarrassing status while drunk on a night out one time? (Let’s be honest, we’ve all done it!) If it’s not information specific to that job, it’s not a recruiter’s business. Secondly, it’s potentially illegal. From looking at personal accounts, you could learn about the candidate’s age, religion, ethnicity, marriage status, etc., etc., etc. In short, you could be learning about things that could accelerate into discrimination lawsuits. Taking screening too far could get very messy indeed. And lastly (although this list could be extended), let’s not forget that personal social media posts can very easily be taken out of context. If you don’t know the candidate, you don’t know whether the controversial update they’ve written is dripping in irony or if it’s meant in full seriousness. You don’t know whether they were just having a horrifically bad day when they wrote that raging rant or whether their inappropriate comment was in fact a ‘frape’ by a friend playing a prank. You can’t make hiring decisions based on invasive social media assumptions. It’s natural that you want to find out as much about your candidate as possible. And that’s why you Stopshould stop stalking and start talking. Distinguish between private and professional social media platforms. 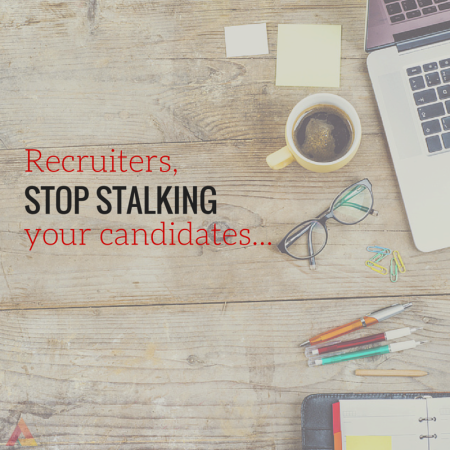 Stop using social media to stalk candidates and search for their personal information. Seek out information about the specific job instead. Speak to the candidate, ask behavioral interview questions and get digging deeper. You can only find out the candidate’s suitability for the role by having those all-important conversations, not by clicking through their selfies. Hey, your candidate might turn out to be a raging lunatic. But at least find that out directly rather than through guesswork from their personal social media updates. After all, we all know that one person who’s an annoying idiot on Facebook but a great (and successful) person in real life. Think of that person the next time you’re tempted to do some personal social stalking and resist the urge. This entry was posted in Candidate Selection, Interviewing on July 16, 2015 by ZFR. 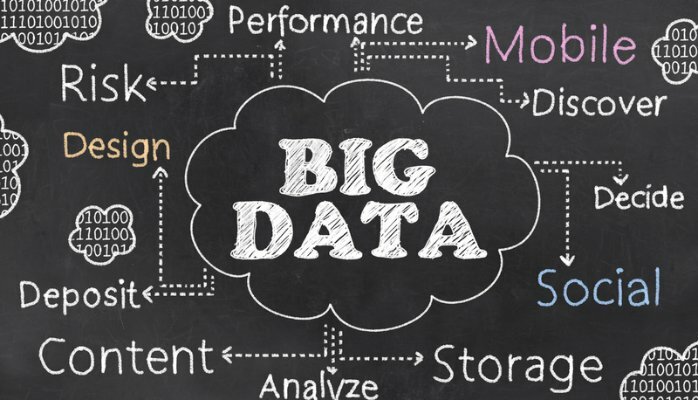 What does big data mean to start ups and small businesses? We read a lot these days about how big data will create new growth opportunities and how it will create sustainable competitive advantage, providing the means for companies to outperform their peers. But we also read that big data requires vast investments in big data frameworks, analytical software, data warehouses and data scientists who can build complicated models to guide companies through the maze. The size of these investments often exceeds the financial abilities of many small companies. So, does that mean big data lies outside the realm of small business? Not at all. The December 2013 issue of the Harvard Business Review contained a very interesting paper titled ‘You May Not Need Big Data After All’. One of the arguments put forward by authors, Jeanne Ross, Cynthia Beath and Anne Quaadgras, was that many companies don’t know how to make the most of the data they already have embedded in their core operating systems. They invest heavily in big data but fail to get a satisfactory return on that investment. Until executives learn how to use data and analysis to support their operating decisions, they will not be in a position to benefit from big data. For all companies, the starting point is to develop a culture of evidence-based decision-making. For years, we have used market research to compete more effectively in our marketplace. What has changed significantly is the substantial increase in the source of our data. We are now creating new information 50 times faster than we did ten years ago, generating a staggering 2.5 exabytes of data every day and the volume is growing. Still, the need for evidence-based decision-making has not changed. There is no doubt that with the volume of data being generated, as well as the different formats of the data (structured and unstructured), companies will need to make changes to the way they operate if they are to take advantage of this new-found wealth of intelligence. With the rapid advances in technology, business leaders must ensure that management practices keep abreast of their technology platforms. This will certainly require the hiring of appropriately qualified and experienced staff, plus an investment in training and development programs. But small business doesn’t need to compete head-on financially with big business for people like data scientists, data architects or PhD data analysts. Compensation is important, but for those with moderate human capital budgets, there are a number of areas where small business leaders can succeed. First, data gurus are motivated to work in an environment where they are constantly challenged, in companies that are innovative, have highly interesting data sets and are willing to invest in the new technologies. Large companies can pay top market rates for a data scientist, but if the job is boring or they feel their skills are not being fully utilized, they will move on quickly, seeking more nimble and agile workplaces where they can be closer to the decisions. What also sets top data specialists apart is their curiosity. They are always looking for patterns in data that seem invisible to others. It may take them some time to develop appropriate algorithms to enable them to detect these patterns, but eventually they will find them and the rewards will be substantial. Appealing to this inquisitiveness increases the recruitment and retention success rate. Most importantly, they need (like anyone) to feel valued, allowing them to participate in the decision-making process rather than being hidden away in a dark corner, allows them to feel valued (and also gives the company even better insight). The surge in demand for data scientists has been well documented and the number of people with deep analytical experience is shrinking. One effective option for small businesses is to recruit at the level of experienced data or software engineer. What these people may lack in mathematical theory and data modeling techniques is often more than made up for by being grounded in the real world. Good data engineers will have the experience to understand big data analytics applications, take the data insights generated and turn them into operational reality. Many will also be experts with big data frameworks such as Hadoop and Spark, along with scale-out NoSQL databases such as MongoDG, Counchbase and OrientDB. These skills will be sufficient to get small businesses effectively started down the big data highway. Developing an effective data platform is not simply a matter of obtaining the intelligence from a variety of different sources and undertaking the appropriate analysis, but ensuring data quality standards are maintained, getting the material into the right formats that will enable evidence-based decisions and getting the information to all relevant personnel in the organization quickly. There are skilled people other than just data scientists who can provide the right big data support for small businesses, even though in the longer term, business leaders may need to provide the necessary training and development to take these people to the next level. The key, however, is to act sooner rather than later. With the numbers of available top-end data scientists across the globe diminishing, skilled data engineers will be next on the list. And when you are successful in your recruitment, ensure that you do everything to hang on to your talent. This entry was posted in Recruiting for Startups, Specific Positions on July 15, 2015 by ZFR. First impressions are important. Within the first five minutes of an initial meeting, you probably know if the candidate is the right person for the role. With video interviews, you can still get a first impression of a candidate even if you’re unable to meet face to face due to your busy schedule. RecruitLoop’s video interviews let candidates record their blind answers via a webcam and can speed up the process, allowing you to screen more candidates while on the go. According to Forbes, 70% of job seekers use their mobile devices for job searches. And, 23% of keyword searches that include the word “job” come from mobile devices. Meghan Biro, writing for Forbes, provides a pretty compelling case to switch to mobile, citing that companies who fail to adopt mobile run the risk of falling behind in the search for talent. Savvy recruiters can gain a leg up in the industry with the right mobile tools. Smartphones like the Google Nexus 6 phablet offer the functionality of a traditional cell, with the screen size and capabilities of a modern tablet. This device is great for recruiters because of its long-lasting battery life. Its Turbo Charging takes just 15 minutes to get a 6-hour charge, so it lets you get more done and do less charging while on the go. With the Google Nexus 6, you won’t have to rely on your desktop or laptop; you have everything you need right in your hands. No list of recruiting tools is complete without LinkedIn. According to recruiting software company Recruiter Box, a staggering 94% of recruiters use LinkedIn to screen potential new hires. On-the-go talent professionals who use Apple devices can use the LinkedIn Recruiter App. Using the app via your smartphone makes discovering new talent effortless. You can search and review the profiles of potential candidates, respond or reach out via InMail, email and text potential candidates. The app also gives you access to updates concerning applicants, saved searches and the profile changes of potential hires that you follow. The LinkedIn Recruiter app helps keep you organized throughout the entire process. You can save the profiles of candidates to folders and add notes. With the app, you never have to worry about missing a message or not responding to an applicant while on the go. The helpful alerts pop up in real time when candidates reply, so you can respond in a matter of seconds, no matter what your busy schedule looks like. This entry was posted in Interviewing, Recruiting Trends on July 7, 2015 by ZFR. Humans are biased decision makers. One well-known and troubling example of this is the tendency for interviewers to hire candidates who remind them of themselves, resulting in workplace homogeneity. In the tech sector, this homogeneity has been particularly extreme: Google’s first ever diversity report, released last year, reported only 2% of its staff are black, and 3% Hispanic, for example. Facebook recently announced that it’s going to try the NFL’s “Rooney Rule”—which requires that NFL teams interview minority candidates for coaching positions—in order to expand its staff beyond white and Asian men. One proposed solution is to try to remove some of those biases with systematic analysis of data—or in other words: Use an algorithm. Companies administer personality tests to candidates during screening, and then use data analysis to determine its ideal hires. While the algorithm depends on what a company is looking for, common variables include using the data from personality tests to predict whether a candidate will quit or steal on the job. Algorithmic hiring has been on the rise in recent years. Google used an algorithm to staff up quickly, employing an elaborate survey to zone in on candidates who will fit into the company’s culture. One study of algorithmic hiring found that a simple equation was significantly better than humans at identifying high-performing employees. The result held across different industries and levels of employment, and the researchers attributed the result to humans paying too much attention to inconsequential details and using information about candidates inconsistently. Now, one company is reporting that algorithmic hiring can also improve diversity. Infor Talent Science provides software that helps companies hire by collecting behavioral information using a survey, then making a predictive model based on top performers. They then hire based on how candidates match up with those top performers. The company dug into data on 50,000 hires for their clients and found an average increase of 26% in African Americans and Hispanics hires across a variety of industries and jobs after deploying Infor’s software. “What we’ve found is regardless of [the industry], whether it’s restaurants, retail, call centers—it actually increases the diversity of the population,” says Jason Taylor, Infor’s chief scientist for human capital management. In Infor’s forthcoming report, they found that using an algorithm to help with hiring increased their wholesale clients’ Hispanic hires by 31%. For their restaurant clients, African American hires increased by 60%. One of the caveats of Infor’s study is that their data is only based on hires that disclosed ethnic background. As with most surveys, checking the racial box is voluntary. Collecting racial data has long been tricky as candidates often worry that that it will result in discrimination. (The Census Bureau too suffers from this problem, and it is experimenting with new ways to collecting data about race and origin.) But it’s not clear that, in the end, minority candidates are undercounted: Others might believe that disclosing race will attract diversity-minded employers. There’s plenty of research on the reasons that diversity is good for the workplace: It increases productivity; it enhances problem solving; it’s even been shown to increase sales and improve profits. The question of whether workplace diversity is good seems to have been answered, but the question of how to attain such diversity seems to be the more baffling one. At least the early results seem to indicate that algorithmic hiring can help reduce biases, but an employer has to care about doing so. In other words, though Infor’s results are encouraging, what matters most is that companies are genuinely interested in increasing diversity in the workplace. Fee Recruiter is a new and better way to find great talent. This entry was posted in Candidate Selection, Recruiting Trends on July 2, 2015 by ZFR.